Santa Claus - also known as Kris Kringle, Saint Nicholas, Father Christmas or just Santa, is apparently not cutting it as a member of the patriarchy depending on who you ask. A survey conducted by GraphicSprings on what could be done to "modernize" Santa was created based on suggestions by 400 people - after which 4,000 respondents across the UK and US voted on what Santa could do to get with the program. The good news? Most people say he shouldn't change a thing; no iPhone, no dreadlocks, no flying car, no tattoos - and Santa certainly shouldn't shave his beard. 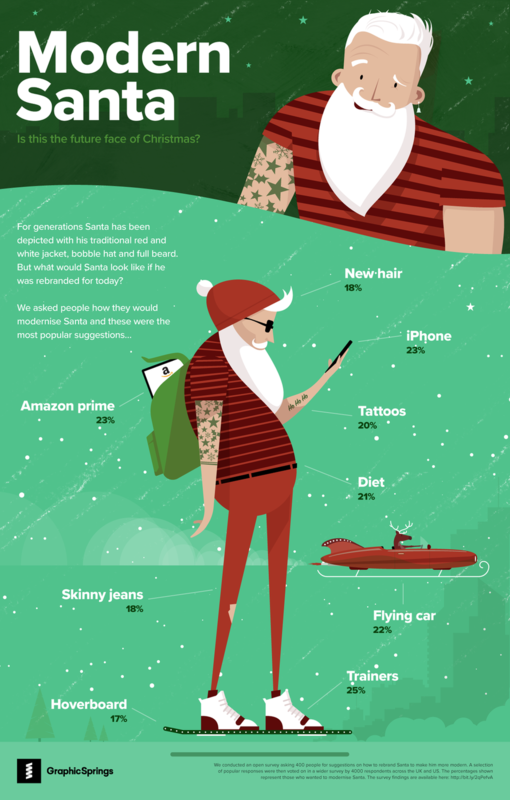 That said, 18.6 percent of Americans who answered the question "If you could 'rebrand' Santa for modern society, what gender would he be?' said that Santa should lose his sack and be gender neutral. 11 percent thought the Christmas icon should be a woman. Across the pond, 15.6 percent of Brits also thought Santa should be gender neutral, while just about the same number thought he should be a woman.